Andrew Solomon’s Far From the Tree: Parents, Children, and the Search for Identity: What he misses about raising a child with Down syndrome. There is an element of cowardice in Andrew Solomon’s Far From the Tree: Parents, Children, and the Search for Identity. If you’d told me five years ago that I was soon to bear a disabled child with blood cancer—for whom I’d have to surrender, possibly forever, career and love life—I’d have contemplated suicide. Moreover, I would have thought this a level-headed response: not an act of despair but a lucid sort of Swiss-style euthanasia. I was a driven freelance writer and a headlong romantic with no interest in children. I had always assumed I’d have a husband (or perhaps three) and no kid. It had never occurred to me I might have a kid and no husband. Not me, the expectant mother with the nursery decorated in 12 colors four months ahead of due date. I didn’t have a nursery. I didn’t even have a separate room in the bohemian studio I inhabited in Paris, where I eked out an income scribbling for America’s embattled book reviews. Our child, as it turned out, was not blond; she was not healthy, and the only person running was her dad. He headed for the hills of Crete when his daughter was 16 days old, changed his phone number, eliminated his email account, and instructed his family members to have no more communication with me. From that day on, it was the two of us girls in Paris: the mentally challenged infant and the know-nothing mother. A match made in hell. Or was it? Leaving aside the question of whether one can measure happiness in coffee spoons and, more troublingly, compare the real happiness of an existing child to the potential happiness of a nonexisting child, it is a cliché of developmental psychology that kids with disabilities like Down syndrome often outstrip their peers in joie de vivre. Something about their trust, tenacity, and tenderness—as well as their often uninhibited engagement with other people—seems to equip them for lives that are not darker than the lives of sensitive intellectuals but brighter. Cut to: Paris, fall 2012. I am sitting next to my cherry-lipped, porcelain-skinned daughter, now 4 years old. I step out of the medical transport van that has ferried us home from her preschool and heave her onto the sidewalk. She giggles and extends two fingers to stroke my cheek. Before the driver can pull away from the curb, I gather her against my heart, draw back a few inches, smile in wonder into her radiant smile, and kiss her face and hair and temples as holiday shoppers stop and stare. Eurydice’s and my walks through town are punctuated by spontaneous remakes of Doisneau’s “The Kiss”—except with toddler and mother switched in for boy and girl. Not that things are easy: Before we’ve covered the 250 yards between the door of the medical van and our apartment building, Eurydice will have darted into traffic three times. 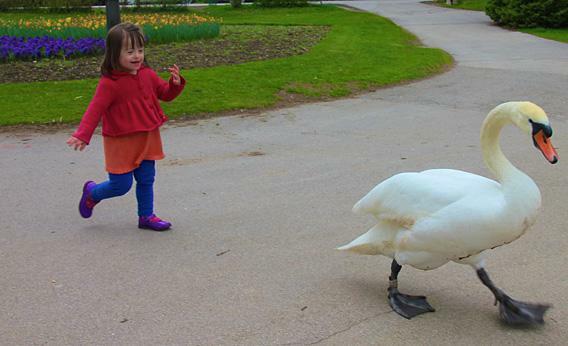 Like a few other kids with Down syndrome, she is inhabited by an irrepressible compulsion to break out and explore, which combined with her perfect fearlessness causes me a great deal more stress than many of the better-known problems of Down syndrome. Walking with my child is like trying to corral a kitten. You hold her by the scruff of the neck, or you lose her. Once the French fire brigade returned her when she made off from a playground—I had turned my head for an instant; she’d gone six blocks in two minutes. This scruff-holding is more than physical; it is medical and mental. After spending her first year of life with serial lung infections, Eurydice evolved a frequently fatal leukemia—another risk factor of Down syndrome, albeit a rare one. Six months of outpatient blood transfusions gave way to seven months of inpatient chemotherapy. During this period there was no exit from the hospital isolation room for either of us. Several times Eurydice hovered on the edge of death. She lost her long chestnut-colored locks and saw her satin baby chest carved up to make room for three consecutive catheters. Still today, there is a garish scar over her heart across which—either in obedience to a subconscious sense of theater or in memory of the nurses who applied disinfectant to her wound—Eurydice likes to smear blood-red lipstick. 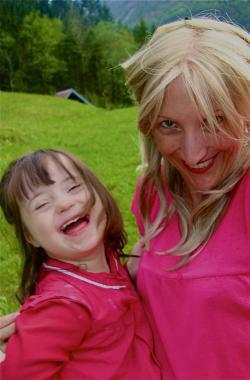 It is sometimes said—and Solomon’s book often echoes this bias—that autism is mysterious, Down syndrome is not. Autists are prodigies, introverts, misunderstood; people with Down syndrome are just dumb and dull. And yet, Eurydice has always been mysterious to me. To this day she does not speak—or, rather, she does not speak any publicly recognized language. But she has an enormous amount to say, uncanny capacities for observation, and startling social intelligence. In the French-English-German universe she inhabits, she has invented a vernacular all her own in which she makes orations so self-assured, well-inflected, and precisely punctuated by rhetorical gesticulation that strangers often inquire which language it is she’s speaking. Wherever she goes, she brings people together—imperiously gesturing to cantankerous couples to sit down together and lifting their palms onto each others’ thighs, reconciling warring classmates by joining their hands, and charming child-leery adults with flirty smiles and studious imitations of their idiosyncrasies. Her gifts are the opposite of my own: Where I am shy, she is bold; where I am good with (known) words, she is good with drama, dance, and music; where I am frightened of groups, she loves them, and the children in her preschool compete hard to sit by her side at lunchtime as the nurses in her hospital petitioned to be assigned to her room. 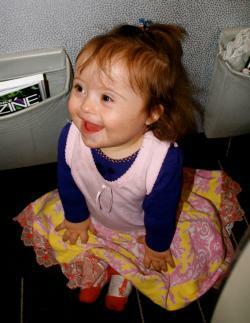 Am I “cheerily generalizing” as Solomon says of other Down syndrome parents, “from a few accomplishments” of my child? Perhaps I am. But one thing I’ve learned these last four years that possibly Solomon has not: All of our accomplishments are few. All of our accomplishments are minor: my scribblings, his book, the best lines of the best living poets. We embroider away at our tiny tatters of insight as though the world hung on them, when it is chiefly we ourselves who hang on them. Often a dog or cat with none of our advanced skills can offer more comfort to our neighbor than we can. (Think: Would you rather live with Shakespeare or a cute puppy?) Each of us has the ability to give only a little bit of joy to those around us. I would wager Eurydice gives as much as any person alive. As I write these words, it is not clear to me that Solomon has learned all he might have from his 10-year investigation into diverse parenting. He has reached several convincing conclusions, to be sure: “Hard love is in no way inferior to easy love,” he writes, and “Diversity is what unites us all.” While not risky, these observations are well-articulated and abundantly corroborated. I embrace especially his point on struggle: “The happy ending of tragedies,” he notes, “have a dignity beyond the happy endings of comedies.” Warriors at heart, we cherish what we’ve gone to battle for far more than what’s been handed to us with a lifetime warranty and a lollipop. It’s when Solomon turns to his own life after hundreds of pages of publicizing the diverse, disabled, and combative lives of others that his unreconstructed conventionality emerges most obviously—and his cowardice. When all is said and done, Solomon mainly wants to bank an A-1 baby. While quickly regretting the “economic privilege” required for the engineering of his perfect offspring, he becomes “extremely deliberate about the egg selection.” Having prepared the ground for his reproductive missions by marrying his partner in a “shot-gun wedding” at the ancestral estate of the late Diana, princess of Wales, Solomon sifts donor profiles, consults attorneys, and flies around the globe to negotiate optimal parenting conditions. But when the boy is born and needs a not-uncommon 5-minute CT scan, Solomon is ready to flee. Not merely does he panic, but he finds himself “try[ing] hard not to love” his newborn and has visions of “giving him up into [the] care” of an institution. All this within moments of a very small question being raised about the perfection of his child. All this from the author of Far From the Tree. It’s hard to imagine that parents of disabled and dying children will recognize Solomon’s “ship” as their own. Regardless, Solomon’s kids (and he now claims three more via the sperm donations he or his partner have made) still have many opportunities to teach him what his interview subjects have only done in part. I, too, am a slow learner. Every day, Eurydice has a thousand things to teach, and every day I assimilate precious few. One thing I have grasped though is that the more I do, the more I can do. Raising my girl taps resources that did not exist five years ago. In many ways, she’s still a baby—not yet continent, not yet talking. Some days I fear she will go from being a baby to being an invalid. 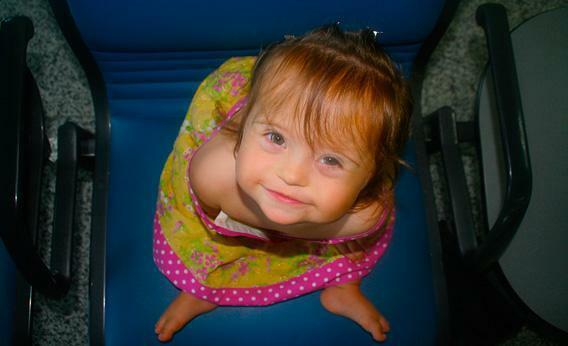 Medical risks are legion with Down syndrome, and they come on quickly. There are reasons to think the future could be harder—not easier—than the present. But while certain experts (repeatedly quoted by Solomon) have suggested that this leads to “chronic sadness” in parents of children with Down syndrome, I find it leads to “chronic carpe diem”—a chronic desire to seize the day and wring the best possible from every moment—and from myself. I know I will not be able to “pass a baton” to Eurydice the way parents sometimes hope to do with their kids. She is not going to take over my “business” or answer my calling: If I want to sweeten the world a bit through writing, I’d better the hell get down to it myself—the constraints be damned. My child is no baton-bearer; she has her own scepter. I also know she’s unlikely to grow up entirely: She’s unlikely to move out at 18 and leave me to my own adventures, so I try to embark on those adventures right now. Toddler in tow, I take every travel assignment I can get from an editor, board every train, scale every limestone fence, and dip my nose longingly into every long-stemmed tulip. It’s probably a good modus operandi for all of us. The joy Eurydice takes in each detail of life is the most infectious quality I’ve ever known. When she flings her arms around my neck as she does every day, every night, my most recurrent fear is no longer relapsing cancer, no longer early dementia or heart disease or hearing loss—or even the fact that Eurydice is growing up too slowly. It is a testament to how radically this child has transformed me that my most recurrent fear may be that she’s growing up too fast—that one day she could be too mature to give me those massive, resplendent, full-body hugs. If the two of us can avert that catastrophe, I tend to think we can avert them all.